I was already given a ‘golden SSDeV’ pin because of my work in promoting locksport. 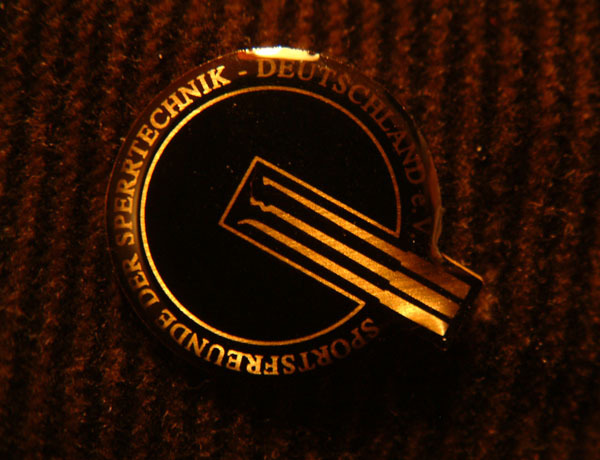 But in general the only people wearing these pins are champions of one of the German locksport disciplines. And up till yesterday, nobody outside of SSDeV earned one that way…. For more then ten years German based SSDeV is organizing championships, and for all that time nobody outside their community managed to win one. Until yesterday, when my dream came true. I finally won a German SSDeV game. In his case the impressioning championships (but frequent readers of this blog could have guessed that). And I really earned and deserved my golden pin the right way! Besides winning the games, I also managed to break the ‘time record’ that was previously owned by Peter Danilov (05:35). I opened my lock in 05:13. 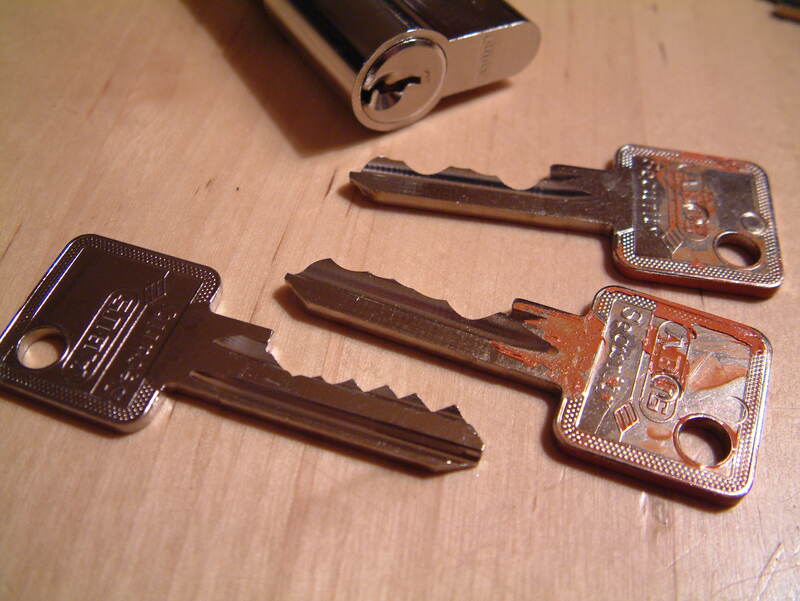 And … in this time even managed to file two keys! My first key was cut too deep, so I had to remove it from my handle and change it for a new one. 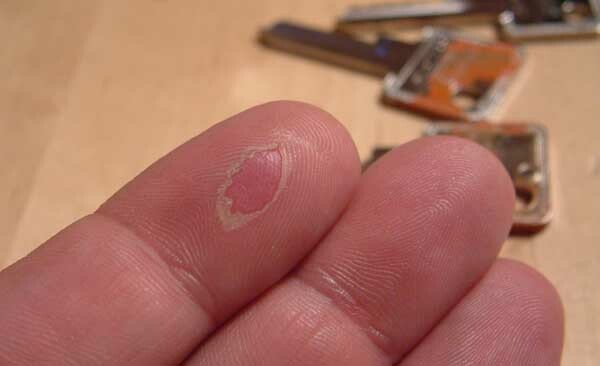 I still do not understand how I managed to file two keys and break the ‘fastest time’ record, but it for sure explains the blister on my finger. For level of completeness: The second place went to Ronald Mayer in 10:51, followed by good old Arthur Meister in 10:52. That is only one second between the second and third place. Fourth place went to DÃƒÂ¶rthe Clemens who was really thrilled by opening her lock in 13:00. Fifth was the person I feared most at the beginning of the games: Dr. Manfred BÃƒÂ¶lker had an off day and opened his lock in 15:24. Sixth was AndrÃƒÂ© Matuschek in 38:40. Last one to open the lock in the 60 minute limit was Micheal H. in 43:54. At the ceremonies, SSDeV president Steffen WernÃƒÂ©ry publicly congratulated me and said he was very happy for me. One sentence later he said (with a smile) that the outcome of this event was a disgrace for the German organization. For the first time ever, a “non-SSDeV’er” became ‘Meister’. He promised ‘a nice reward’ for the person who would bring back the impressioning title to Germany at the Toool.nl organized LockCon event next month. In other words: there is a price on my head 😉 Well … I am not loosing any sleep over that. On the contrary, it is one of the biggest compliments I received in a long time. 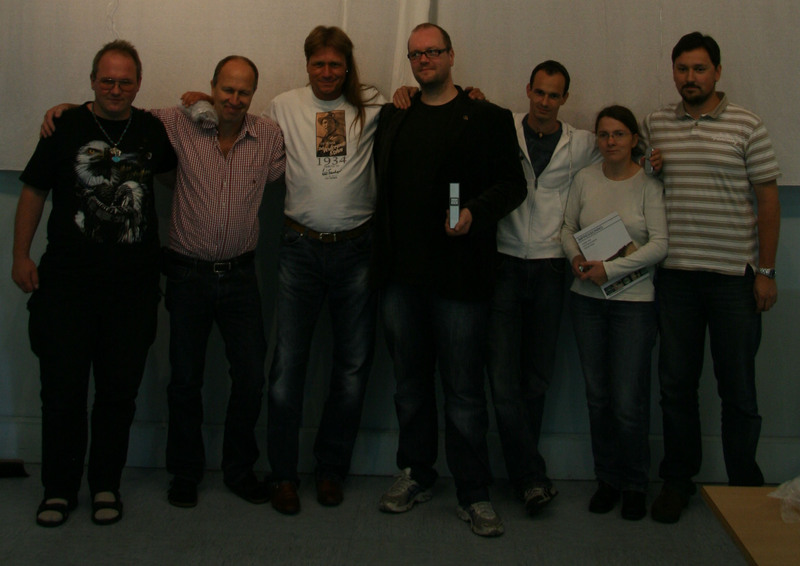 Lets see if at LockCon this tradition of ‘non Germans’ winning lockpicking championships can be continued. I know for a fact we have some good (and fast) lockpickers at Toool.nl, and the list of highly skilled lockpickers coming from other countries is quite impressive too. And we all know it can be done now…. This entry was posted on Monday, September 15th, 2008 at 00:12 and is filed under Uncategorized. You can follow any responses to this entry through the RSS 2.0 feed. You can leave a response, or trackback from your own site. Wow! Congratulations and well done Barry! Certainly a well deserved victory, given the dedication and practice you have put into impressioning. Your winning margin is quite impressive, too! Congratulations Barry, well done! Since it took you two keys, does this mean you can do impressioning at LockCon in about 2 minutes? 🙂 Wow, what an accomplishment, just over five minutes..
And now, back to practising for LockCon! Congratulations, I was there and your time was impressive. A double congratultion, because you are the first “foreigner” who won the “golden” SSDeV pin. But concerning the impressioning championship, during Lockcon it starts all over again. Eventhough it is sad for the person in question but as we all have read,even the very talented amongst us can have a off day…Goodluck in Sneek Manfred!! Gratz with this big achievement. And thanks for the great presentation you gave lately in Delft! Congratulations Barry! You truly deserved that with all the work and time you have dedicated in this sport. Big congratulations, Big Barry! I think there will be never a chance for me to reach this fabulous time. But I will participate anyway in Sneek again. @Jaakko (and maybe other readers of this blog): the color on the keys is applied before the competition, in order to assure that no one can use a prepared key, f.i. you could file it down to the first step before, to save time during competition. I will be at Sneek for the championship I hope I shall get some time for training a little before cause as you know I,m traveling. That was an impressive impressioning in five minutes. There was no blood and no tears at the championship. After sweat ( filing a few hundreds blancs in the last year ) we could see Barry smiling. You are a great champion! You came, you filed, you conquered? Entries (RSS) and Comments (RSS). 49 queries. 0.550 seconds.